As you know, I’ve been scouring the local thrift stores in search of ruined wool, and I haven’t been having much luck in that department. On the other hand, I’ve been finding an amazing cache of hand knits too beautiful to destroy even for the sake of felted art. The jacket above is one example. The amazing thing about these sweaters is that they are all in my size. Some petite knitter with long arms has been donating great things to the thrift stores of Juneau. Last week I found a sweater that was minutes from completion, just a little button band to tidy up. 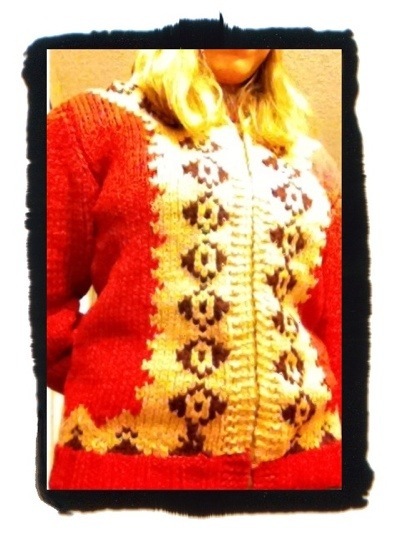 Today I found a well-loved, impeccably knit fair isle and this jacket knit in heavy wool in one of my favorite shades of red. I may never need to knit a sweater again, which would be fine with me, because, as you know, I could be happy making hats and shawls forever. Who is this knitter? I’m afraid she may be deceased. Her progeny must not have the superior taste she possessed: why else would they part with her beautiful things? Maybe she bore only giants and these smaller knit gems didn’t fit anyone in the family. Or, maybe she’s still living, and she loves to anonymously give away her creations. I suppose there is the possibility that my fairy knit-mother is not just one knitter, that the sweaters I’ve found are a random assortment of creations. I may get more clues if the hand knits keep turning up.